Case 1. 30 yo female with leg pain and SOB. R24, T38.5, BP 135/80, P 107. O2 Sat 88%. On exam, patient has rales in right lung. History reveals patient has sickle cell disease. CXR shows right basilar infiltrate. CBC shows leukocytosis and HGB of 6.7. Diagnosis is acute chest syndrome. Critical actions: Opioid pain medication, PRBC transfusion, supplemental oxygen, antibiotic therapy, and hematology consult. You can also give bronchodilators. Caution with IV fluids to avoid pulmonary edema. fever, cough, sputum production, dyspnea, or hypoxia. Adam Bonder comment: Data in pediatric patients shows that early use of incentive spirometers can prevent some cases of acute chest syndrome. The major clinical problems lie (a) in distinguishing between infection and infarction and (b) in establishing the clinical significance of fat embolism. Case2. 16 yo male presents with altered mental status after falling overboard into a lake. Lake water was frigid due to cold weather during late fall. BP 130/80, P52, R 12, Rectal Temp 33.1. ETOH level 160. CT head and CT Cspine are negative. Diagnosis: Environmental hypothermia. Critical actions: Airway assessment/management, Check Glucose, Active re-warming, evaluate for concomitant trauma. 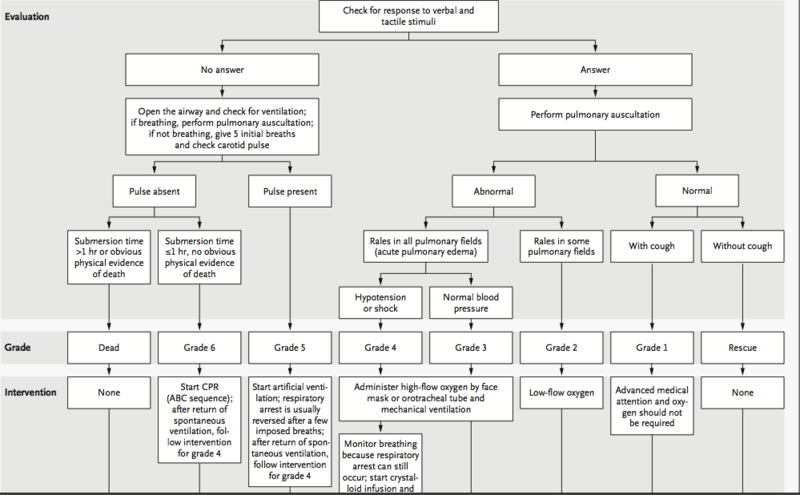 Admit near drowning victims who are symptomatic in any way (cough, altered mental status, dyspneic, abnormal breath sounds) or patients who have CXR or laboratory abnormalities. Asyptomatic patients can be discharged after a period of ED observation. Case 3. 38yo male with left ankle injury while playing basketball. Vitals are normal. Thompson’s test shows no plantar flexion with calf compression. Diagnosis is Achilles tendon rupture . Critical actions: Thompson’s test, pain medication, orthopedic consultation, and splinting/non-weight bearing. Risk factors Achilles tendon rupture include floroquinolones, steroids, and prior Achilles tendon rupture. Elise comment: Always verbalize your thought process behind your decisions when taking the Boards. It helps the examiner assess your knowledge. The current thinking is that you need to be cautious with fluids in sickle cell patients. They all have right heart dysfunction and are prone to pulmonary edema. Be sure to ask for a hypothermia thermometer for hypothermic patients. Harwood comment: You can actually sometime palpate a defect in the Achilles tendon when it is ruptured. Ultrasound also can identify Achilles tendon rupture. Hypothermic patients that are still shivering will usually survive. If patients cannot shiver, you need to actively rewarm them. Those who can’t shiver do have a risk of dying. If the patient is the equivalent of a slab of meat in the fridge and not moving or shivering, you need to actively re-warm them. Use a linear probe to optimize your image of the vessel. Keep the indicator on the probe to the operator’s left. AND The indicator on your screen should match the indicator in your hand. In general both should be on the left. Most ultrasonographers use the transverse view to visualize vessel cannulation. When piercing the skin with your needle, the needle entry point should be back from the probe the same distance as the vessel is from the probe on the screen. You basically are creating a right angle. When the needle is on the vessel on your screen, you actually need to jab the needle into the vessel. Peripheral veins in the upper arm are another good option for vascular access. Mike says any large vein in the upper arm will work. You need a longer than normal angiocath (5cm preferred) to get deep enough. We have the longer angiocaths in the charting room cabinet and in the inventory room. Ultrasound is 95% sensitive and 98% specific when evaluating for extremity DVT. Most lower extremity DVT’s are either in the femoral area (common femoral vein) or the popliteal area (popliteal vein). The clot is usually near joints (hip and knee). You diagnose DVT by demonstrating non-compressibility of the imaged vessel. Full compression means no clot. In the popliteal region, “Pop on Top”. Meaning, the popliteal vein is superficial to the popliteal artery.